The word “storage” can mean a lot of different things to a lot of different people, and the level of anxiety you feel when you hear that word will depend on which type of person you are. But the fact remains, whether you need a little bit of it or a lot of it, almost everyone has some kind of storage need in their life. While some things, like baseball cards, are pretty easy to store, other things, like lawnmowers, campers, ATV’s, boats, or your prized vintage muscle car can be a bit more difficult. Here at FS Construction Services, we understand the dilemma, and we’re here to help. There are a seemingly infinite number of storage options and buildings, so we’ve done our best to break them down into three broad categories: small, medium, and large. Today, we’re going to talk about medium-sized storage buildings. The most common of these you’ll come across is the post-frame building (or, as it’s often called, the pole barn). They are versatile and cost effective but most importantly, they can be designed to meet your needs and store almost anything you can think of. Surely you have seen different shapes and sizes, but the general features remain the same: wood construction with steel siding. 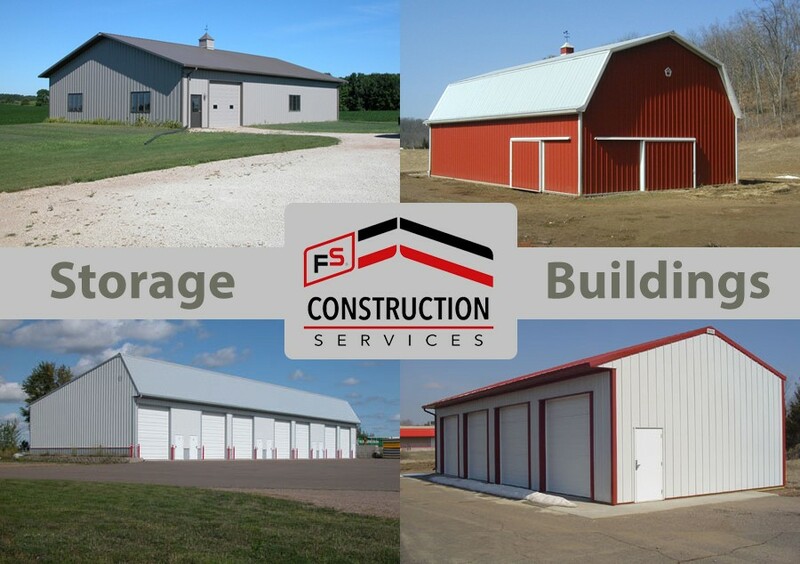 However, for the FS Construction Services team of building professionals, that is just the start to providing you a great, medium sized storage building. With patented STP (Shear Transfer Plate) columns that provide incredible load carrying capacity, multiple color, window, door, porch, wainscotings and roof options, your finished project can look exactly as you envision. One of the great benefits of this type of building is just how versatile and customizable they are. Usually varying from 30-70’ in width and length, these multi-purpose buildings are sometimes used as garages, storage buildings, workshops, leisure space, or some combination of all of them. Additionally, thanks to our partners at Walters Buildings, we can also construct actual storage units. Again, these are highly customizable buildings that can be built to fit specific needs and purposes. With any of these types of buildings, a variety of insulating materials and weather protection can be added to increase comfort and the safety of what’s inside. If you are in need of any kind of storage building, please let Gateway FS Construction Services know. Give us a call at 866-551-3454, and let our specialists help you find exactly what you are looking for. We look forward to providing you the best customer service experience. At FS Construction Services, we feel like we’re always singing the praises of metal roofs, but for good reason. Metal roofs provide a long-lasting solution to roofing needs, with a longevity, durability, and elegance not found in other roofing solutions. However, making a happy client takes more than just the raw materials, no matter how beneficial those materials can be. Such was the case, when we had the opportunity to install a brand-new roof for some clients in our hometown. The 4500 sq. ft. project not only included installation, but also removing the original shingles on the home and shed. Our Building and Construction lead, Tom Marcheski, and his team got to work quickly clearing the way for the attractive, forest green Fabral Stand ‘N Seam panels. These stainless-steel panels boast the highest wind uplift resistance of any standing seam panel, as well as a Class 4 impact rating and a Class A fire rating, meaning they will provide decades of unrivaled protection and cover. As integral as a roof is to any building, they are often easy to overlook until it’s too late. That’s why we’ve partnered with Fabral and their state-of-the-art metal roofs. These roofs don’t rot or erode like standard shingles, and they can last up to 70 years. Whether it’s a smaller residential project or a large commercial project, our team can outfit your structure with the kind of roof that brings considerable peace of mind. In addition to roofing, our team can also take on siding and painting projects, for agricultural, residential, or commercial needs. If you are in need of a new or updated roof, let Gateway FS Construction Services know. Give us a call at 866-551-3454, and let our specialists help you find exactly what you are looking for. We look forward to providing you the best customer service experience. At FS Construction Services, we know that no one ever really wants to get their roof replaced. It’s a big job, and it can be hard to know where to start, who to hire, and what kind of roof to buy. And while we can’t snap our fingers and make a new roof appear, we like to think that we’re the next best thing. Late last fall, we had a client in that exact position, in need of a new roof before the cold winter months set in. We worked with our client to determine the best possible roof for his home, and our team got to work tearing out the old shingles and replacing them with a brand-new Fabral metal roof. These roofs are incredibly durable and can even have a lifespan of up to 70 years. For this particular job, we installed a Horizon S series roof. This standing-seam, concealed-fastener roofing system is made of 26-gauge high-strength steel. It also features a Class A fire resistance rating, a Class 4 hail impact rating, and a Class 90 uplift test rating. With eight colors to choose from, our client was able to find the right fit for his home, providing a fresh look to go along with the unmatched longevity and durability of his new roof. When it comes to roofing, we believe it needs to be done right, and it needs to be done right the first time. The many decades of lasting protection and the peace of mind it brings is well worth the investment. If you are interested in a metal roof for your residential, commercial, or agricultural building, you can let Gateway FS Construction Services know. You can give us a call at 866-551-3454, and let our specialists help you find exactly what you are looking for. We look forward to providing you the best customer service experience.